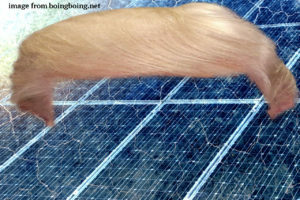 A Tariff on Solar… Just Part of a Bigger Picture. President Trump’s tariff on solar panels (and oddly, washing machines) smacks of protectionism. Prices in the U.S. will go up. Fair trade will shift again. But of particular interest to me is the unilateral decision making by this administration – the adhoc policies that are applied without a basic understanding of a global economy, without addressing human rights issues, without examining the necessity for a sustainable society in the United States, and without considering innovation and technology on a global partnership basis. In short, this – as with other policies of the administration – seems to be knee-jerk reactions. So – what is the Trump Administrations intent here? It is to further support the fossil fuel industry by styming the renewable energy sources industry. By doing this the administration continues to push American Society backward. Our children will pay a heavy price for the decisions Trump and his cabinet are making today. What to do? Get involved. We need a price on carbon (yes it is related to this tariff issue – see www.citizensclimatelobby.org), and we need everyone to write letters to the editor, call our congress persons, and if you can – run for office. Rise Up. Just look at what the amazing women of our country have done to public awareness and action for equality in this year alone.